Rugby Australia said Thursday that it intends to terminate superstar Israel Folau's contract over his latest anti-gay rant, throwing the Wallabies' World Cup plans into disarray. Chief executive Raelene Castle said officials had made repeated and unsuccessful attempts to contact the fullback since his incendiary Instagram post claiming "hell awaits" gays on Wednesday. 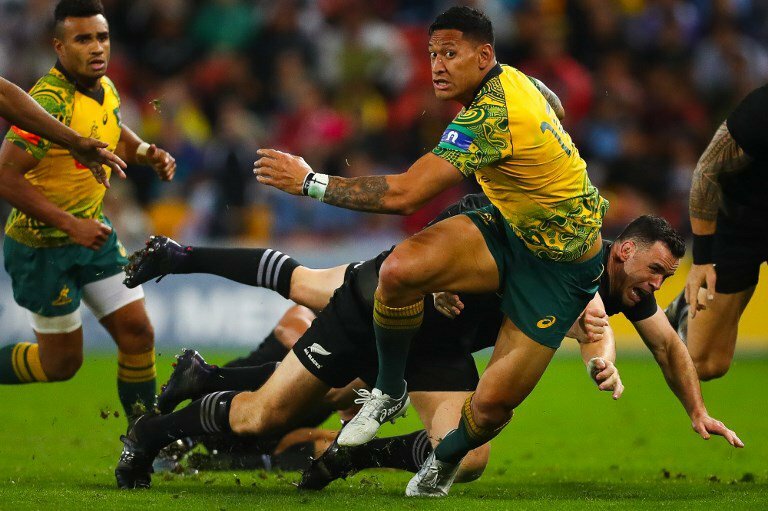 Folau is Super Rugby's all-time top try-scorer and one of the game's most electrifying runners with ball in hand. A stand-out for the Waratahs and on the international stage, he had been considered crucial for the Wallabies' hopes at this year's World Cup in Japan. But his extreme religious views have repeatedly rankled with supporters, Rugby Australia and sponsors. He was reprimanded for homophobic posts last year, but unabashed, on Wednesday the 30-year-old posted an Instagram banner that read: "Drunks, homosexuals, adulterers, liars, fornicators, thieves, atheists and idolators -- Hell awaits you." Castle said in a joint statement with New South Wales Rugby that "whilst Israel is entitled to his religious beliefs, the way in which he has expressed these beliefs is inconsistent with the values of the sport". Folau recently signed a multi-season, multi-million dollar contract. But his fate had appeared to have been sealed earlier in the day when Wallabies team sponsor Qantas public expressed its displeasure at the comments. The airline, whose CEO Alan Joyce is openly gay, said Folau's social media post was "really disappointing". Some leading Australian commentators had called for him to be fired, including former Wallabies forward Peter FitzSimons. England's Joe Marler tweeted an image of two men kissing, accompanied by a heart.